Friday Night Wine and Theatre! The MAS BAUX is a small, fully-operational vineyard practicing organic growing, cultivation, harvesting and production methods. Serge Baux, owner and winemaker, is a man of passion whose philosophy is rooted in a respect for nature. 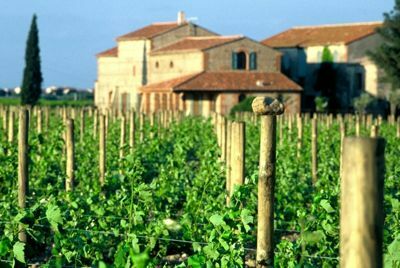 Only a stone’s throw from the Mediterranean, mid-way between Perpignan and Canet along the ancient Roman VIA DOMITIA (containing the oldest vineyards of the Mediterranean countries), the Baux estate is spread out over 20 hectares, 12 of which are planted with vines in full production. A completely restored 18th century Catalan Mas houses the vinification, aging and bottling processes. They are also lucky to have a unique terroir, found in very few other places in the world, covered in naturally-formed round stones sitting on a clay bedrock, and they boast strictly manual green harvests with highly-selective hand-sorting of grapes, producing exceptionally high-quality wines. They are open everyday in summer from 9-7 for visits and tastings offered in both English and French. 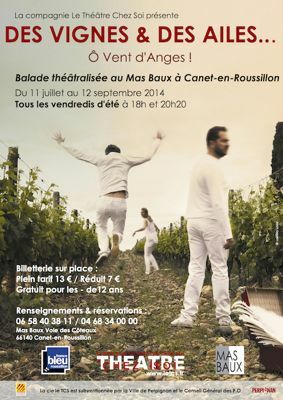 As part of the summer programme ‘Les Vendredis du MAS BAUX’, they are proud to announce Des Vignes & Des Ailes… Ô Vent d’Anges ! , an itinerant theatrical performance at the vineyard. Created and organized by local company Le Théâtre Chez Soi, actors will take their audience on a stroll across the vineyard, stopping to perform at various locations among the vines, in the cellar, on the terrace and who knows where else! These “fallen angels” will perform classic literary works about art, love and wine, from authors such as J. Pommerat, B. Pivot, P. Delerm, B. Vian, J. Cocteau, J-M. Ribes, C. Fréchette, M. Jolivet and C. Baudelaire, among others. Each week will be a different show depending on which actors are present, as each one has his or her specialities. They are happy to invite you to come discover their vineyard and experience theatre in a whole new way! Each performance lasts approximately 55 minutes. Performances in French. To accompany the performances, throughout the month of July, the wine cellar is being turned into a photo gallery. Two photo exhibitions by Laëtitia Lazizi will be on display, entitled “Balade sensible au Mas Baux” and “L’Egérie” (Muse). Showings every Friday from June 11 to September 12th at 6pm and 8:20pm with optional tasting afterward. The company has invited local artists to share the stage for three “Soirées ORiginales” Flamenco with Lorenzo Ruiz, Poetry with Bérénice Quinta and Music with the Trio Scherzando (3 singers, baroque, classical, opera, contemporary, etc.). These three evenings will begin at 8:20pm by a free tasting session. There is no showing at 6pm. They will take place on 1st and 15th August and 12th September.